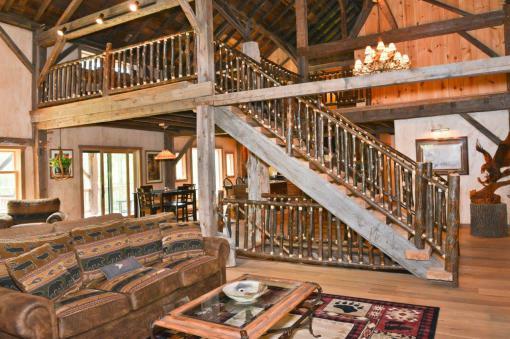 This beautiful 7-bedroom lodge sleeps up to 16 guests comfortably. Located just 3 miles from downtown Wellsboro on 10 private acres. Enjoy total seclusion and quiet relaxation and still be close to great restaurants, downtown shopping, and area attractions including the Pennsylvania Grand Canyon, the Pine Creek Rail Trail, and the Wellsboro Airport. Included is everything you need for a quiet getaway, fun family vacation, family reunion, or a destination wedding: 2 fully-furnished kitchens, covered deck with outdoor furniture, gas grill, outdoor fireplace, horseshoe pits, wi-fi, Direct satellite TV, and much more. Our gorgeous lodge is handicapped accessible, pet-friendly (with prior approval), and kid-friendly.